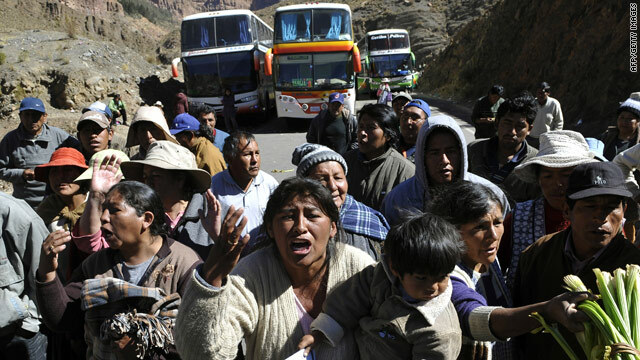 Protesters' blockade of the Bolivian town of Potosi drew an angry reaction Monday from standed bus passengers. (CNN) -- Bolivia's president wants a peaceful solution to a two-week-old protest by residents of a remote Andean city who have cut off all roads, train and air traffic with the rest of the world, a government spokesman said Tuesday. About 6,000 of the 16,000 residents in Potosi, in southwestern Bolivia, have mounted the blockade. They say President Evo Morales has abandoned them after they supported his presidential bid four years ago. The protesters have blocked all the roads into town, as well as the rail line to neighboring Chile. On Saturday, the villagers also closed down the airport. Some protesters also launched a hunger strike, which has been joined by Potosi Province Governor Felix Gonzalez and other officials as well as union leaders. At issue is a boundary dispute with the neighboring department of Oruro. Protesters also say the government hasn't invested enough in their area and have made demands such as better roads and the construction of a modern airport. Presidential spokesman Ivan Canelas said Tuesday the government has no intention of mounting a military operation to end the blockade and urged protesters to come to the negotiating table. The protesters "should put aside their intransigence, end their pressure tactics and partake in dialog as the best path to solve the region's demands," Canelas said at a news conference. "Thousands of children are harmed because schools are closed, as are the health centers and the food markets." More than 100 foreign tourists are believed trapped in the area, news reports said. The leftist Morales, who is indigenous, relied on a broad base of support among indigenous people and the poor -- nearly always one and the same in Bolivia -- for his election victory. Whites in Bolivia account for only 15 percent of the population, according to the CIA World Factbook. About 30 percent of the population is Quechua and another 25 percent are Aymara, both indigenous groups. Meztizos, who are of mixed white and indigenous ancestry, account for 30 percent of the population.